Quite a number of you have been following my personal journey, as well as this website, over the past couple of years. Over that time, I’ve been both humbled and encouraged by a stream of messages to keep pushing, suggesting that eventually I’d reach the goal of becoming a full-time motoring journalist. On 13 March 2013 I firmly placed a foot on the bottom rung of the ladder when I had my first feature published in Autocar. Over the past 18 months, by virtue of dogged determination and gentle harassment, I’ve been fortunate enough to write for a number of websites and print titles, including respected names such as CAR, MSN Cars, XCAR and the Lincolnshire Echo. But the Autocar piece was my first motoring article to be run through the production presses and subsequently will be fondly remembered. Jim Holder, Autocar’s Editor, generously took a punt on me producing a piece, almost a year after I first made tentative enquiries about writing something for the famous motoring weekly. 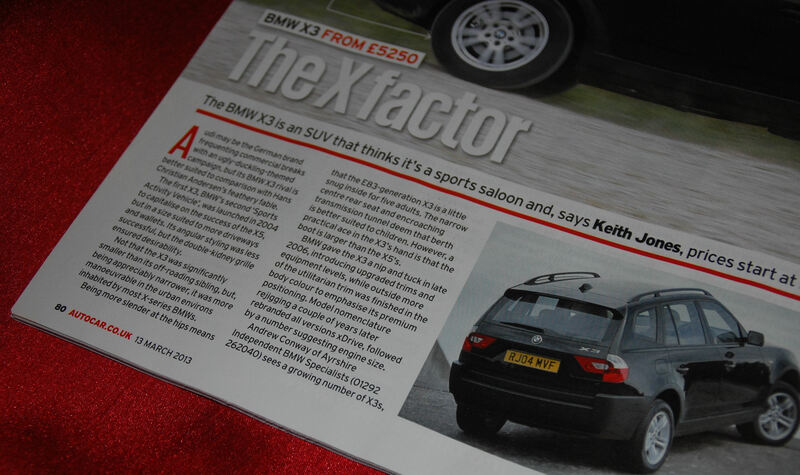 Whether it was my infectious enthusiasm, the Guild of Motoring Writers’ Breakthrough Blogger Award or the fact Jim simply wanted to shut me up, I was offered the opportunity write a buyer’s guide for BMW’s first generation X3. The intervening weeks, as the cliché goes, are history and by mid-March my name was there, in print, in the world’s longest running car magazine. It feels narcissistic saying I was proud to see my name on the page, emboldened in the by-line, but I did have to repeatedly look at it in order to actually believe it, developing that warm feeling inside as it began to sink in.